Why does so much of English Canada still yearn for comforts of British empire, even in autumn of 2012? 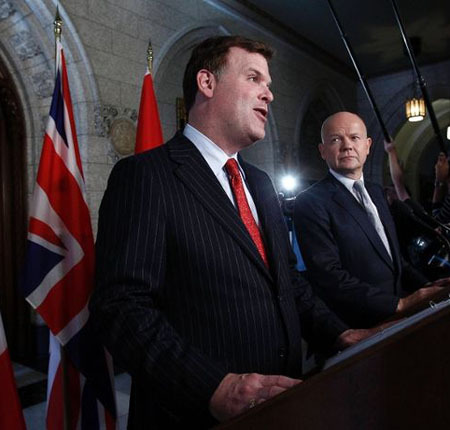 Foreign Minister John Baird (L) speaks during a news conference with Britain's Foreign Secretary William Hague on Parliament Hill in Ottawa September 24, 2012. REUTERS/Chris Wattie. 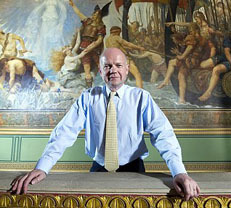 For some Canadians — if opinion polls are to be believed, even for at least a bare majority, coast to coast to coast — the news that “Canada and Britain to run combined embassies” or “Canada, Britain to sign deal to ‘link up’ embassies abroad” or “Canada and Britain to join diplomatic forces” or “Canada, Britain eye joint embassies” will bring sceptical feelings (to say the least). I confess I am one of them. Generally, of course, there is absolutely nothing wrong with Canada’s making arrangements with other countries for the sharing of diplomatic representation responsibilities in suitable circumstances. I was recently pleased myself, eg, to hear that “Italy to represent Canada in Iran after pullout.” And there has been a “Canada-Australia Consular Services Sharing Agreement” since 1986. For Canada, however, the United Kingdom, whose Mother of Parliaments first breathed legal life into what we Canadians now call our Constitution Act, 1867, is not just another country. While for some among us this is still apparently a good reason for Canada and Britain to run combined embassies, for others (and again like myself) it is still a very good reason to do no such thing. 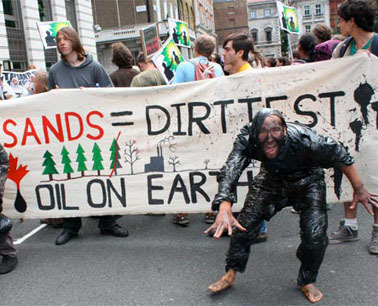 British protesters demonstrating against Canada's tar sands development outside the Canadian High Commission in London. Photo by Zoe Cormier. All this also brought to my mind a recent posting on the counterweights website itself : “Iran parliamentarians think it is the British queen who has closed Canada’s embassy in Tehran!”And what other countries, I wondered, hearing about the new “joint UK-Canadian diplomatic missions abroad,” are going to jump to similar conclusions about how (as the Iran parliamentarians put it) “Canada is a country supervised by the UK” — as it actually used to be, before the 1931 Statute of Westminister, or the first Canadian Citizenship Act of 1947, or the new Canadian flag of 1965, or the Constitution Act, 1982 and its accompanying Canadian Charter of Rights and Freedoms? Even the sometimes remarkably obtuse powers that be in Ottawa these days seem to have quickly enough figured out that the underlying ancient Canadian populist symbolism behind this whole “Canada and Britain to run combined embassies” announcement was starting to get out of hand — and perhaps even give the opposition a little too much of the chewable red meat it currently appears to lack. 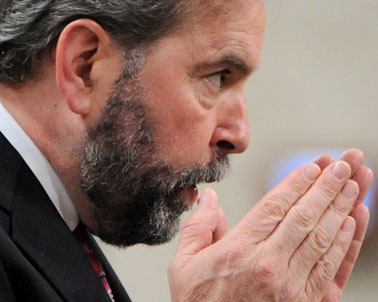 At the same time, I also think that those of us who do feel as I do ought to be at least trying to face up to some unpleasant truths about the long process of decolonization in Canada, in the autumn of 2012. Both the Globe and Mail and the CBC websites have been conducting (admittedly unscientific but …) online polls on “Should Canada share embassies with Britain to cut costs?” (Globe) and “Is it a good idea for Canada and the UK to share consular and diplomatic services in other countries?” (CBC). And in both cases something like an even 50% of respondents are answering Yes! 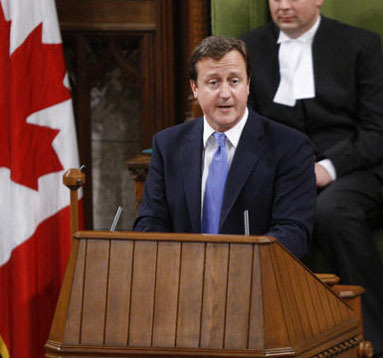 British Prime Minister David Cameron address Canadian Parliament in Ottawa, September 22, 2011. ADRIAN WYLD/THE CANADIAN PRESS . At the same time again, when the results from Quebec — strongly skewed against the British monarchy (and understandably enough) — are removed from the numbers, only between 43% and 46% want to retire the monarchy right now in the other nine provinces. Those of us in the predominantly English-speaking provinces who strongly believe the “long process of decolonization that Canada has undergone since 1867” must come to some kind of courageous end sooner rather than later still have a lot of work do.